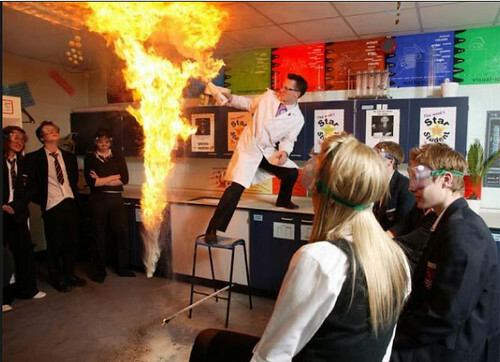 The Observer runs an article about a Chemistry techer, Neil Dixon, who runs exciting & practical lessons in the classroom. Imagine the Risk Assessment he must have had to complete before doing these. "British people are now more spied upon by their political leaders than any other population in the free world, according to an official report. The linkage of databases and surveillance systems mean people are now having their movements tracked, habits profiled and photograph taken hundreds of times a day. The findings, in a report compiled on behalf of Richard Thomas, the information commissioner, raised concerns that Britain is “waking up in a surveillance society”." And They Say Classrooms are for Learning? "I was on MSN and someone from China popped up, but they were typing in Chinese and I didn't get it. So I went online and found an Chinese to English translator and copied and pasted their posts into it and I figured out what they were saying. Then I wrote what I wanted to say, got it translated into Chinese and then pasted it into MSN. It was a pretty cool night." Wow! There are so many lessons about connected kids, a world which is becoming more connected as I type, new online free technologies and the changing role of teachers! What a wonderful time away! 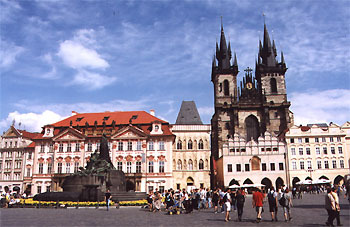 I would recommend visting Prague to anyone (unless you are a vegetarian - we only ate meat dishes.) Check out our pictures on www.schonken.com. Now that we have our "little red books", we have booked a couple of nights in Prague. The flight leaves at 16:50 this evening. It was not long ago that I was congratulating Kelly on his 7th World Title (link), but here he goes again! The Greatest Surfer of all time? Probably! Well done chaps and girls. Oz take gold as Team Champions, but Jordy Smith & Mathew Moir take individual gold for SA. Rosy Hodge and the SA Tag Team take individual bronze. The Open University is making its educational resources available free on the net for anyone in the world to use. I know it has been a long time! Things have been rather busy here, but here are a few cool links to keep you busy! have fun - I will post soon!